These are all accurate responses. In truth, most people don’t know the actual definition of a meme. It is in fact, “an idea, behavior, or style that spreads from person to person within a culture.” Coined in 1976, the idea of the meme is far older than “Overly Attached Girlfriend.” Today a meme can be defined as a piece of content that is copied and/or spread rapidly through social media. So that covers all manner of things from viral videos to GIFs to the “What I Actually Do” posters. These little content nuggets are innovative, interesting and an obvious choice for the edgy content marketer. First and foremost, memes are popular. They are shareable and personal. In the last two years Google has seen a spike in meme searches, especially for GIFs. A GIF is an image that repeats on a loop. In 2012, the fashion company Diesel jumped on the GIF wagon and produced some incredible shots for their Autumn/Winter Campaign. The results are more eye catching than the standard static image, and are smaller than the standard fashion video. Memes gain popularity because they have something we can all relate to. They express an emotion or situation that everyone experiences at one point in time. For example, the “Success Kid” meme is an image of a child who has clearly achieved a small victory. It conjures up nostalgic feelings of when you correctly answered a question in math class. Virgin Mobile recognized the potential of this viral image and used it in the ad below. 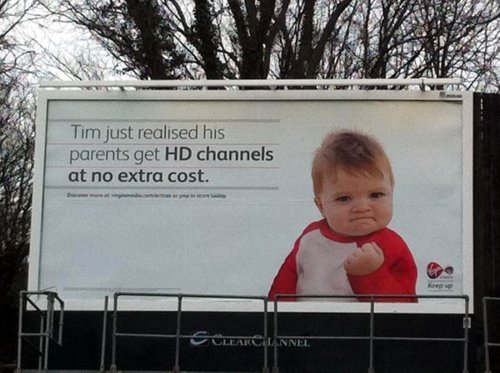 By using the “Success Kid”, Virgin is saying to their consumer, “Hey, we like this little guy, too.” It isn’t overt, but it makes Virgin more relatable. 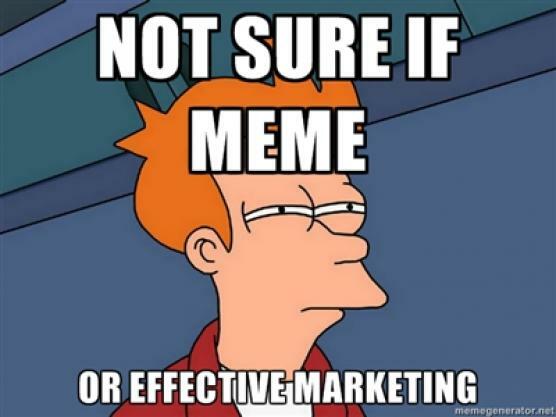 The Internet meme is here to stay, so we as content marketers need to embrace the silly GIFs, viral videos, slogans featuring a young Keanu Reeves and all the possibilities they bring. They hold an enormous amount of potential to make our brands popular, relatable and funny. I say kudos to those early adopters who are showing us how it’s done! What memes are catching your eye? What brands are doing it right?